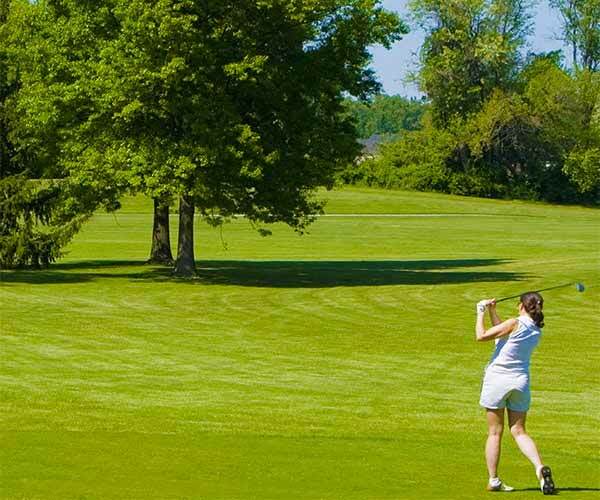 Saratoga Springs NY Golf: Putting Tips For Improving Your Golf Game On Saratoga Greens! Saratoga Golf: Putting Tips for a Successful Day on the Greens! Whether you're just hitting the links or have decided to take up Saratoga golf, putting tips may make the difference between a memorable golf game and one you'd rather forget. Since a par score assumes two putts per hole, this is a huge part of the game! It's important to choose the right putter and know how to approach the putt - and it's something that is convenient to practice both on and off the course. Practice! There is no substitute for becoming comfortable with the stance, the movement, and the feel for distance that is required when putting. Posture is key: don't follow the ball with your body! Stay in your putting position Ã¯Â¿Â½ arms, shoulders, knees and feel parallel with your target line Ã¯Â¿Â½ making sure the face of your putter remains at right angles to the hole. Don't look at the ball when you're making your shot Ã¯Â¿Â½ look just head of the ball where you want it to go. Relax! One of the most important tips for putting is to not think about where the ball is going to go, concentrate on your stroke. Whether you're playing on a public or private course, it's never a bad idea to consider taking a few private golf putting tips or lessons from private or public courses such as Saratoga National Golf Club. Golf pros can help you with all aspects of your game, teaching you techniques, Saratoga golf putting tips and tricks to your golf game from beginning to end.